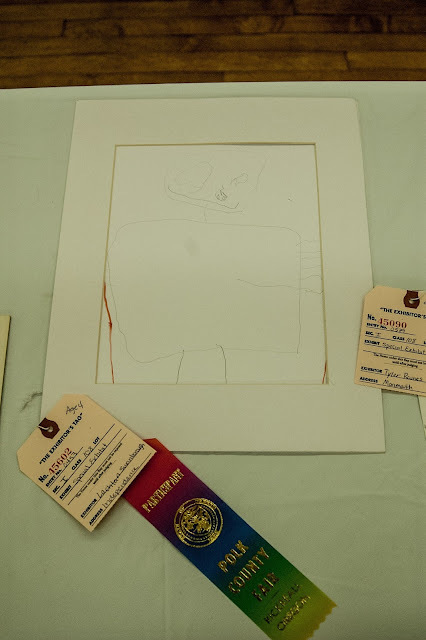 When I decided to submit Lachlan's art work into the Polk County Fair I didn't think to look to see when the fair was running. Well it was of course running the weekend of August 8th through the 11th. I say of course because I have had a wedding on the schedule for months now. A friend asked if I would take photos for her wedding, I said yes, and have been preparing all summer. I was nervous and had a hard time thinking about other things. So I told Jeff, Sunday, Sunday afternoon. After church we went straight to the fair, you know, right during nap time. But it actually went really well. Lachlan had a long list of animals he wanted to see. 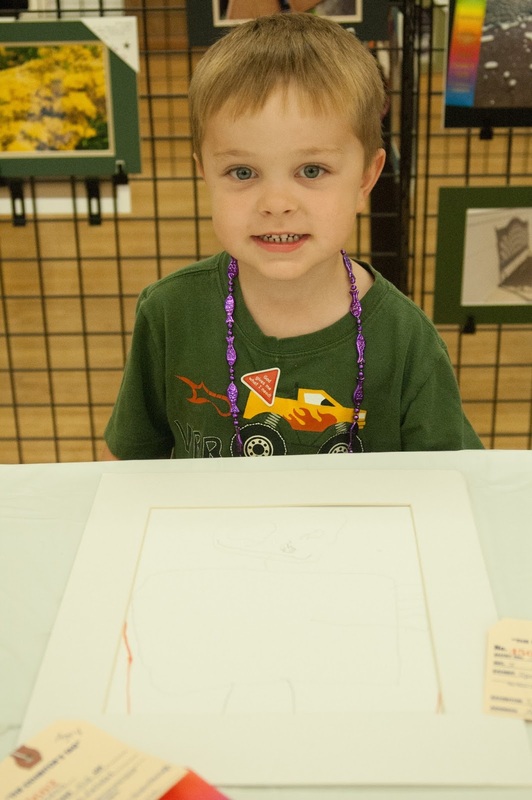 When I reminded him of his art being displayed he really didn't seem to care. He said we could see it after all the animals were all seen. Alright then. We ended up being right by the building and I told Lachlan we would just run right in. I found his art work and saw the beautiful participation ribbon attached. I told Lachlan to look at the table to see if he recognized anything. His eyes searched until it came upon his art. I pointed out the ribbon and his jaw dropped. I love his jaw drop look of excitement. He thought it was pretty darn cool. I edited this one so you could try to see the drawing. It has to be pretty dark or his self portrait get's washed out. 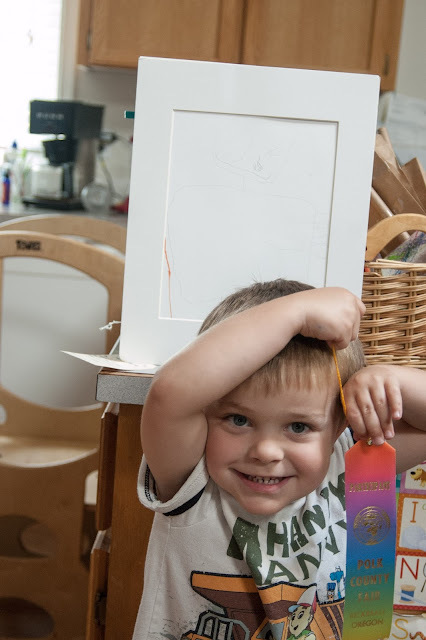 Lachlan was pretty quickly over the fact that he had a ribbon and displayed his art and was ready to see the animals. That's okay though, it was worth a shot. I thought maybe the idea of creating something for others to view and enjoy would spur on his creative side. He never has been into coloring or art. That's where Mother Goose Time has pushed us both to be more creative with crafts. I would have never asked him to do a self portrait with out their encouragement. And I love this little drawing. He does seem to like to take pictures like Mommy. So maybe we will explore that route next year and get one of his pictures printed to enter. We were able to go pick it up later that night and bring home the ribbon. I had it all on the counter on display when he asked me to take a picture of him holding his ribbon. So I think the idea of the ribbon is starting to sink in. He did take it to bed with him that night. He is still, however, fixated on getting a trophy like cousin Colton, I guess they are shinier. All in all it was a fun experience. We will do it again, I will just make sure to start the conversation earlier. Maybe he will recall his experience this year and be able to more fully participate in choosing what he would like to enter. I am sure with more invested this will be a bigger deal to him. But for now, it was a great place to start.